MEOW! Has D-List Celebrity Sir Sorbet Been Catnapped? There is discontent in the world of celebrity cats. Sir Sorbet’s own account only has 1,282 followers, but his claim to fame is that he is the adoptive brother of Sunglasscat, a cat perhaps best known for wearing sunglasses, who has over 34,000 followers and seems to make regular enough appearances to list a booking email in its bio. According to Karen, the woman behind these accounts, fellow cat celebrity mother Ruth (the owner of fellow celebrity Persian cats Duffalo and Fergie La French) offered to watch Sorbet while Karen buried her father who had recently died. But now, Ruth is refusing to return Sorbet home. According to Ruth, this is an issue of neglect. His body condition was a 3/9—only 2 is lower. You could feel every bone in his body. There were no underlying reasons for him to weigh so little and this did not happen in 6 days. His fur was matted all over, but especially on his belly. He had a URI [upper respiratory infection] and could barely keep his eyes open. Here’s what I witnessed. Sorbet was starved for attention, but as he realized he would not be abandoned again he gained confidence and was less needy. He also gained a pound under my care in a week. This isn’t the first time Karen has left her cats for long periods, the Instagram post claims. Reached by phone, the vet Sorbet reportedly visited would not disclose information about the cat to anyone other than his owner. 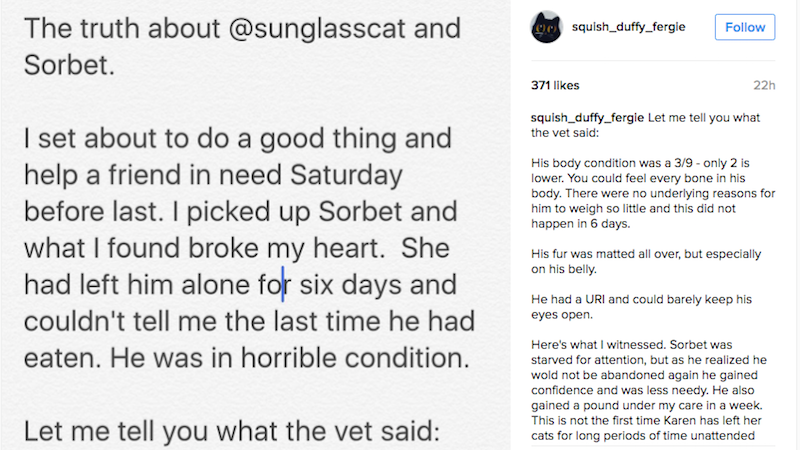 Ruth’s account is corroborated by an earlier post from @Sunglasscat, in which Karen details how she found Sir Sorbet sick one evening and Ruth stepped in to take him to the vet. Commenters have since jumped on Karen; perhaps if she had taken better care of Sir Sorbet, this wouldn’t have happened, commenters claimed. If a cat seems neglected, anyone would have to intervene. Ruth claims in one of her Instagram posts that she has evidence—texts from Karen and the vet bill—to prove that her motives are true. Jezebel has reached out to both parties for comment. We will update if we hear back. Update (5:30 p.m.): Sir Sorbet and Sunglasscat’s accounts have both been made private.